There are few people that have done more to push the boundaries of 3D printing than MIT Media Lab professor Neri Oxman. Her pioneering design research projects have resulted in a pavilion constructed by silkworms and robots, a technique for 3D printing glass and a haunting collection of death masks. She shot to fame designing a residence for artist Gabriel Orozco, yet Mexico-based Bilbao gets far more excited talking about her ideas for overhauling the homes of the country's poorest. She was previously an advisor to Mexico City's housing department, and has used that experience to develop innovative solutions that could change lives – like the adaptable house she presented at the inaugural Chicago Architecture Biennial. There aren't many designers who would respond to a brief from Marcel Wanders to design "a lamp that even my grandmother would like" with a life-size horse, but that chutzpah is what sets Front apart. Although only two (Anna Lindgren and Sofia Lagerkvist) of the original foursome remain, they've been standard-bearers for collective creative leadership in an industry too often ruled by egos. The hyper-energetic, hyper-intelligent stage designer has worked with practically every big name in the music business, most recently masterminding Katy Perry's politically charged appearances at the Grammys and the Brits, but still dedicates significant amounts of time to her first (but less financially lucrative) love, the theatre, collaborating regularly with the National Theatre in London. 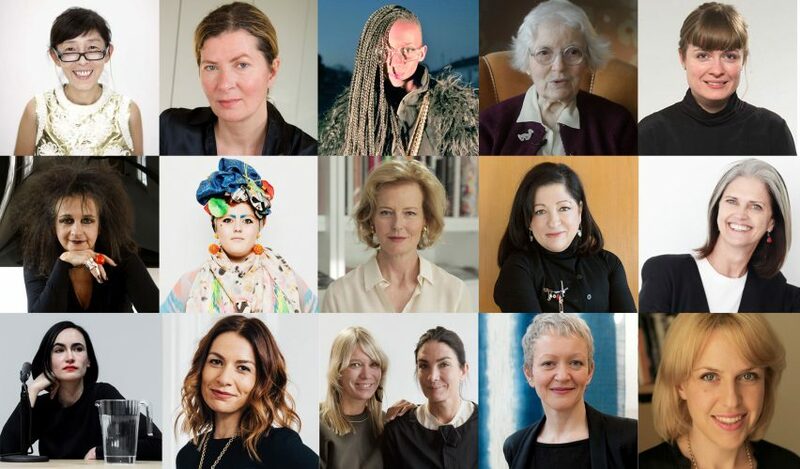 The current RIBA president, only the third woman to hold the post, is a breath of fresh air at the rather stuffy, male-dominated institution. She ensured the late Zaha Hadid got a long-overdue Royal Gold Medal and, at the other end of the scale, has introduced warmth through simple touches such as asking guests at formal RIBA dinners to show their appreciation by applauding the kitchen staff. Irish duo Yvonne Farrell and Shelley McNamara are among the most well-respected architects in the industry, thanks not only to their powerful but poetic architectural style, but also to their warm personalities. Their Dublin-based firm Grafton Architects is nearly 40 years old, but is showing no signs of slowing down – in the last 12 months they won the inaugural RIBA International Prize for a Peru university, and were chosen to curate the next Venice Architecture Biennale. She's one of the original punks, and certainly the one who's stayed the most relevant. Vivienne Westwood is always in the headlines for something, and usually something good – like walking her own runway at 75, posing in a "Don't let an older generation decide your future" T-shirt, or campaigning for action on climate change. The Eklund sisters have transformed Swedish flooring company Bolon into a glamorous international brand through a compelling mixture of hard work, boldness of vision and a strong dose of charm. Hats off too to their (largely) female team, including chief marketing and sales officer Helen Emanuelsson and project leader Petra Ek. The editor of both the Architects Journal and Architectural Review, Murray has worked tirelessly to promote women in the profession and is the brains behind the titles' Women in Architecture initiative. Earlier this year she was rewarded with a well-deserved RIBA fellowship, partly for her work in this field. The visionary young Senegalese fashion designer has long ploughed her own furrow, creating an alternative universe of cosmic fashion and graphics, upending African cliches in the process. A unique and independent force. With a personality as vibrant as her colourful designs, Walala is renowned for her Memphis-style paintwork. Her grand canvases continue to pop up everywhere, adorning everything from a cloakroom at London's Roundhouse to a WeWork co-working office. She has even applied it to a zebra crossing. The Serbian-born fashion designer and neighbour of Dezeen has dressed powerful women including Michelle Obama and Samantha Cameron (Melania Trump bought her number off the peg) but eschews the airs and graces of other fashion royalty, remaining down-to-earth and accessible. A partner at London architecture studio dRMM, Morgan has become the most politically connected architect in the UK and the most convincing advocate of the importance of design we have. She manages to achieve this while giving the impression the whole thing is a huge giggle, which is all the more impressive since she fought off breast cancer last year. The magnetic French designer is a force of nature and a genuine pioneer, speaking ten to the dozen while painting visionary pictures of non-standard topics such as space travel and undersea exploration. Yet unlike many stargazers, Ben Hayoun tends to pull off her visions, collaborating with everyone from NASA and the SETI Institute to Icelandic post-rock ground Sigur Rós. Lucy McRae's recent projects include a video featuring a fictional "institute of isolation"
Self-proclaimed 'body architect' and previous Dezeen collaborator, McRae's cutting-edge work continues to pioneer ways that design could prep us for space and the future. Her visionary projects range from a human vacuum chamber to an institute of isolation. A true British icon, Julia Peyton-Jones has been one of the world's biggest patrons of contemporary architecture. By launching the now world-famous Serpentine Pavilion programme, she has championed talents like Sou Fujimoto and Selgascano. Her retirement was a surprise to many, as was the news that, at 64, she has become a mother – yet somehow she deals with every situation with grace and style. It can't have been fun being the only woman in a room sometimes, but we're immensely thankful designer Patricia Urquiola stuck it out in the business these 27 years. Not only has the now art director of Cassina paved the way for so many others, her colourful furniture and characterful homeware consistently impress. A British entrepreneur who built a global e-commerce empire, Massenet founded online designer fashion portal Net-a-Porter in 2000. Fifteen years later, the company had generated £1.32 billion in revenue. Having stepped down from that role – gaining a damehood in the meantime – she is now poised to catapult competitor site Farfetch to similar success, and also serves as chairman of the British Fashion Council. A hugely inspirational figure, Ilse Crawford has been a pioneer in interior design. As the founding editor-in-chief of Elle Decoration UK, she offered an much-needed alternative to the chintzy British home, while her design office Studioilse has shown how minimalism and warmth can go hand in hand. She has collaborated with some of the biggest names in the industry, from IKEA to Vitra, but is still an incredibly warm and likeable character. "Radical goth" Odile Decq is well known for her bold architectural and personal style. She has been forthright in her advocacy for gender equality in the profession throughout her career, and scooped a number of awards recognising it. Shunning teaching positions at prestigious institutions across the globe, she founded her own architecture school – the Confluence Institute – three years ago to challenge conservative and outdated teaching methods. Syrian architect Marwa Al-Sabouni remained in her home city of Homs, essentially imprisoned, for two years during the Syrian civil war. Through her memoir, writings for global magazines and newspapers, and a TED talk, Al-Sabouni has become an outspoken advocate of rebuilding the half-destroyed city. Her work is defined by courage, resilience and optimism – she is brilliant. Scher became the first female principal at design firm Pentagram in the early 90s and went on to become one of the most prolific and successful graphic designers in, not only the firm, but the industry. She is known for her cut-and-paste postmodernist style, which she has used in in the rebranding of major institutions, such as MoMa and the New York City Ballet. Japanese architect Kazuyo Sejima is one half of multi-award-winning partnership SANAA, but also a prolific designer in her own right. Despite being publicity shy, Sejima has risen to a cult-like status in the architecture world. She is probably the most respected architect in Japan which, in such a male-dominated culture and industry, is remarkable. Menswear designer Katie Eary has built a fashion empire at just 29 years old. Surreal prints and animal iconography regularly feature in her runway collections, and cropped up on homeware in her 2016 collaboration with IKEA. The impressive Balshaw has just become the first female director the Tate galleries, encompassing Tate Modern and Tate Britain in London, as well as Tate St Ives and Tate Liverpool. The appointment recognises her immense contribution to Manchester's arts and culture activities, where she oversaw the much-praised expansion of The Whitworth. Human rights advocate Elise Roy was thrust into the spotlight after her TED talk on designing for disability went viral last year. Deaf from age 10, Elise argues persuasively for a human-centred design approach towards solving everyday problems. Despite being one of the founders of the postmodern movement, Denise Scott Brown became over-shadowed by her husband and partner when only he was awarded the Pritzker Prize. Over 20 years later, she bravely spoke out about the snub – and ended up shining a huge spotlight on misogyny in the profession. Pritzker refused to budge on its decision, but Scott Brown has since been awarded both the AIA Gold Medal and the Jane Drew Prize for a lifetime of outstanding work. Wood's larger-then-life character is inescapable – not only in the vividly hued ceramics and furniture pieces she produces, but also in the flamboyant outfits she puts together (and especially when she matches them all). She is an outstanding role model for anyone who has ever feared being different. Since being named CEO of the Serpentine last summer, philanthropist and entrepreneur Yana Peel has put in place an exciting and innovative tech-focused curatorial programme. She is championing all things digital as a means to create experiences that go beyond traditional exhibitions. Peel also holds many advisory positions across the arts, she is a Young Global Leader of the World Economic Forum, and the author of a bestselling children's book. The tallest building designed by a woman is the work of American architect Jeanne Gang, whose 348-metre Vista skyscraper is under construction in Chicago. Her firm Studio Gang is working on high-profile projects worldwide, from the extension of New York's American Museum of Natural History to a new US embassy in Brasilia. Since setting up her eponymous Copenhagen studio in the late 90s, Mandrup has been quietly churning out beautiful and sensitive additions to the Nordic countryside and cityscape. We've published just a handful of her projects, but they earned her a place at 177 among the architects included on the Dezeen Hot List – a testament to how well received they have been. Lindsey Adelman is a pioneer of New York’s lighting design scene and a key figure in the city's burgeoning industry. Since setting up her eponymous studio in 2006, the American designer has sold her work through international galleries and fostered talents including Bec Brittain and Mary Wallis. A protégé of Lindsey Adelman, Bec Brittain has dazzled the New York lighting scene with her own sculptural designs, and has become one of the city's brightest talents. The former architect uses her background to create more angular and technical-looking pieces that sets her apart from her peers. Polish architecture photographer Dobrucka continues to travel far and wide to produce images that tell interesting stories, from documenting the rapid growth of skyscraper construction in Mumbai, India, to Le Corbusier's 1960s Dominican convent near Lyon, France, and more recently studying the seemingly temporary dwellings of a West Bank village. Following in the footsteps of a wildly successful father can be daunting, but Simone Rocha found her own feet on the UK's fashion scene. She has captivated the industry with her feminine floral designs that are soft and feminine yet powerful, and her London Fashion Week shows are among the most anticipated each season. When many architects dress head-to-toe in black, Myerscough is often the only person in the room wearing neon brights – an approach that acts as metaphor for her design approach. Since founding her London-based multidisciplinary studio, she has been on a mission to bring boldness and diversity to the industry, and has applied her vibrant graphic style to everything from hospital wards to the Barbican Centre. As MoMA's senior curator of architecture and design, the dynamic Paola Antonelli is transforming the museum's archive with her rapid-response approach to collecting. It has so far resulted in acquisitions that include universal symbols like the Rainbow Flag, @, and the original set of emoji. But her dreams are much bigger – her hope is to add a Boeing 747 to the MoMA collection. From furniture to fashion design, Toogood applies a thoughtful process and signature aesthetic to every design. Her gender-neutral retail spaces for London's Selfridges pushed the issue of gender fluidity into the mainstream – and many high-street fashion retailers following suit by creating their own genderless collections. Fashion and technology combine with (literally) electrifying results in Iris Van Herpen's collections. She has used everything from 3D-printing and magnetism to create and even "grow" ephemeral gowns and sculptural silhouettes, presenting them on models in vacuum packs and high-voltage cages. In 2011, she became the youngest member to join Paris' Haute Couture calendar, but remains modest and humble about her growing success. One of the hottest young architects to emerge from Mexico's burgeoning design scene, Escobedo was selected to represent the country during a year-long celebration of Mexican culture in the UK. Her influences are broad-ranging – from the Aztec patterns that inspired her installation at the V&A museum to the delicate latticed overlay she created for a 1960s-inspired painting studio in Cuernavaca. This London-based architectural studio is sadly one of very few run solely by women. But its founders, Tatiana von Preussen, Catherine Pease and Jessica Reynolds, haven't let that get in their way – in fact they use it to their advantage; they claim it helps them offer something different in a competitive industry. The trio have only completed a few projects so far, but their imaginative Vaulted House suggests we can expect great things from them. Exactly how many members make up architecture collective Assemble is not always clear, but Strelitz is easily the most memorable, thanks to the confidence she exudes when talking (quite articulately) about the team's many achievements. Despite winning the Turner Prize, she and her partners are still promoting the same community-focused approach to architecture that brought them together. American architect Deborah Berke simultaneously runs a busy New York studio of more than 50 people and acts as dean of Yale’s prestigious architecture school. Her current projects include the transformation of a former prison on Manhattan's West Side into a permanent home for the women’s rights movement. A pioneering young designer exploring how design can help guide humanity through the ethical dilemmas of the future. Her engagement with scientists, working on synthetic biology for example, has helped put the spotlight on the potential for artificial lifeforms. The transgender creative director of Google's Creative Lab in Sydney is at the forefront of exploring how human intelligence and creativity relates to, and differs from, artificial intelligence and creativity. With her talk containing the catchphrase "Doubt is cool", she was one of the outstanding speakers at this year’s Design Indaba conference. Another standout speaker from Design Indaba, Moross is a prolific, convention-defying art director, illustrator and graphic designer who most recently designed stage sets for the MTV Music Video Awards and One Direction's tour. It's hard not to like Sarah Herda, so it's fantastic to know she's the decision-maker behind one of the world's most influential art funds, the Graham Foundation. The charity has helped fund everything from the Serpentine Pavilion to the National Building Museum in Washington DC. But there are plenty more strings to her bow, as she proved by rounding up a stellar list of contributors to the first Chicago Architecture Biennial, which she co-curated alongside Joseph Grima. This Dutch fashion designer is a rising star in the world of wearable tech. She has gained notoriety for her solar-powered garments and smart tops that corrects posture, but is also an active keynote speaker and lecturer. A fifth-generation descendent of a Stoke on Trent pottery family, Johnson relaunched her defunkt family firm as 1882 Ltd through a mixture of vision, design and business acumen, providing a template for revitalising traditional industries. Until recent male recruit Danil Boparai joined us at the end of last year the Dezeen editorial team in London was exclusively female (Dan Howarth, the only other guy, moved to New York a year ago to head up our US operation). Led by Amy Frearson, you will never find a more hard-working or dedicated team anywhere in architecture and design publishing (or anywhere else for that matter).